Ooh I just love weddings. I don't think I'll ever be able to say that enough. This morning started off in the cheesiest, most movie-scripted manner possible as I literally popped up in bed, flung off my covers, and said to my puppy, "It's wedding day, Sophie!" as if it was Christmas morning or my birthday. But, I had a good reason to be that excited to start the day, because this wedding was such a purely happy and special occasion. Kristen and Ronald became Mr. & Mrs. today, and although I have literally known them for less than 48 hours, I couldn't be more thrilled. I adore meeting couples who are friendly and genuinely excited to be in love with one another. These two definitely meet that description.I just wish that I could have been a bigger part of the planning and designing process of their wedding! If you've been keeping up with my blog, these are the cards I've been talking about crafting throughout this past week! Aren't they lovely? Kristen sent us two stories to include on the cards; one about how her and Ronald met and the other about how he proposed. We hung them from ribbon loops on the sides of the ceremony chairs, which added a warm touch. One of the things that make Kristen and Ronald so great is that they put a lot of thought into how to make their wedding a comfortable and enjoyable experience for their guests. For instance, they had this drink station for everyone to enjoy as they walked into the ceremony. 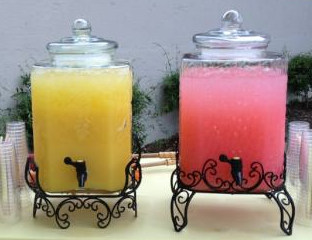 It featured orange-ade and pink lemonade to match the color scheme of the wedding. They also provided fans for everyone to use to cool down since it was quite a toasty day outside today! Kristen's bouquet, designed by Amy Lynne Originals, was breathtakingly beautiful. It was full of peonies, gerber daisies, godetias, and billy balls. Doesn't it make you want to smile? One of my favorite aspects of this bouquet, which unfortunately you can't see from this angle, was that Kristen attached her sorority pin to the fabric wrapped around the stems. Being in a sorority myself, I understand the significance of this as it shows that you are a sister for life and that the bonds you formed years ago are still a strong part of who you are as a woman today. The most touching detail of the wedding was their guest book alternative. Kristen's mother loves to sew, and suggested that the couple should provide patches of fabric for guests to sign in place of a guest book. Some guests simply wrote their names while others decided to leave a kind message for the newlyweds. The mother of the bride has graciously offered to sew these patches into a quilt for Kristen and Roland to keep for years to come. It is such a unique idea that I'm sure will be cherished by the two as they journey through life together. So, after seeing all of these details can you get a better sense of why I was so darn excited to get out of bed this morning? I had the good fortune to be a part of this experience today, and I'm happy that I got to help make it a special one for all who were present. That is why I do this. Bringing joy to others on what will be remembered as one of the happiest days of their life is the most gratifying feeling in the entire world. And I get to do that almost every weekend this summer. Isn't that cool? I sure think so.